Pop-up/Drop-in class! Try out a class on Dec 11 before committing to the winter series! Current students can attend as a make up for any classes missed in the Sept-Dec series. 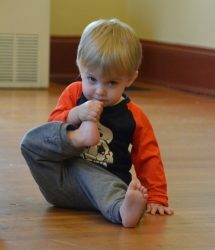 Toddler Family Yoga (walking-4 years) classes are engaging and fun. Class incorporates age-appropriate yoga poses, dance and creative movement, songs, stories, and games as children learn yoga through social interaction, repetition, and play. Yoga can help toddlers and preschoolers learn how to relieve frustration, improve motor skills, and increase attention span by actively following directions. 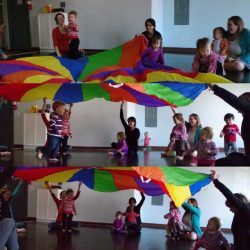 We incorporate imagination, songs, words and stories and age-appropriate postures and activities to support your preschooler’s growth and development while creating an enriching family activity. We encourage each child to embrace their own unique expression of yoga poses while supporting their development and growth. 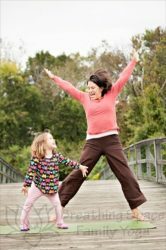 Parents and children playfully move together through poses, songs, and activities appropriate for early walkers through preschoolers. Appropriate from steady walking through 4 years. Younger siblings welcome: Walking siblings older than 1 year must register. Crawling or in-arms babies may attend free. 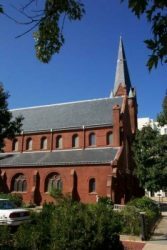 St Marks Episcopal Church is located at at 301 A St SE (map), just a block off Pennsylvania Ave SE and a few blocks walk from Union Station. The most prominent part of the building is the Nave, or sanctuary. To access the dance studio (or undercroft for camp), enter through the A-Street courtyard. Use the door by the bike racks and take the stairs or elevator to the left of the entry way. Tuesday early childhood and baby yoga classes are held in the dance studio on the second floor. Strollers can be left in the lobby downstairs or brought up and stored outside of the studio door. Please remove shoes before entering the dance studio. Bathrooms are on the lobby level. Jennifer Mueller has been teaching yoga for children and families in Washington DC since 2008. Jen is a Yoga Alliance® Experienced Registered Yoga Teacher (E-RTY 200) and Registered Children’s Yoga Teacher (RCTY) as well as a Certified Educator of Infant Massage (CEIM), and an International Board Certified Lactation Consultant (IBCLC). Jen teaches Breathing Space Baby Yoga & Play classes, Tot, Toddler and Little Families Yoga, afterschool yoga, Baby Signing Time, and directs day-off and summer camps . . . in addition to lactation consulting and doing bunch of behind the scenes stuff to keep it all running. Like so many, Jen first came to the yoga mat because of an injury, seeking nothing more than to feel better and balance her body for running. When she became a mother, her yoga practice became even more important: for building strength and flexibility, as relief for the discomforts of pregnancy and then the stresses of parenthood, as a reminder of the miracle of the human body and of her own resources and capabilities, and a regular connection to her breath and true Self during a time of significant identity changes. Her weekly baby yoga class during maternity leave encouraged her to embrace her daughter in the same loving, non-judgemental way that her own practice did for herself. 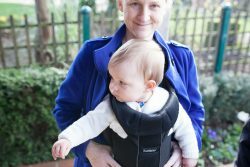 After being unable to find baby yoga class in the neighborhood that fit her work schedule, Jen stumbled on a listing for Itsy Bitsy Yoga facilitators training . . . and signed up. That turned out to be the first step on new path. Jen is honored to share her expertise with others who wish to share yoga with children as a teacher trainer for ChildLight Yoga, nationally recognized children’s yoga school. Jen co-authored and instructs the ChildLight Yoga for Babies & Toddlers Teacher Training (newborn-2 yrs) and instructs the ChildLight Yoga & Mindfulness for Children Teacher Training (ages 2-12). Learn more about local trainings with Jen or offerings around the country. You might also run into Jen over at the Breastfeeding Center for Greater Washington DC, either as a consultant or in the twice-monthly Baby Care Basics class.